Thought I would post some new work I just completed for the new Columbia Games block game Ancient Kings that will be shipped at the end of the month (March 25th). As most of my illustration work is black and white ink drawings, this is a bit different for me, but I really enjoyed the process. As a great admirer of Japanese prints with their wonderful design and subtle color relationships, I thought it would be nice to incorporate some of what I like from those prints into these images. The final images are to be printed as 3/4″ square sticker which will be placed on wood block game pieces. That is pretty small. So they have to be strong silhouettes which are easy to read in game play. I drew them out at 2″x2″. I decided to ink them by hand, scan them into the computer and color them in in Photoshop. I used a few texture overlays and gradient fills to get that Japanese woodcut feel. Please ignore that I misspelled Cavalry as Calvary. There is not going to be a crucifixion game piece. 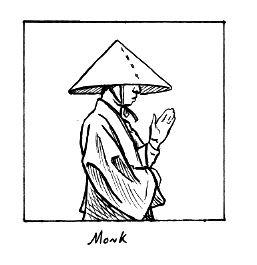 I had draw the Monk with a hat I liked better, but I was asked to draw it a bit more historically accurate as shown above. Here is a look at my first attempt. In hindsight I wish the group of images were more consistent in style. While I feel they work pretty well, I wish a few were a bit more stylized. I also probably got a bit carried away with the detail, but I had great fun doing these- I could not help myself. The most difficult one to do was the ship. It was hard to find good references for a Samurai ship. I wanted big sails so I could design the image with a light in front of the dark sky, and the darker ship over lighter water. I found a lot of non-military Junk type ships and a lot of warships without sails. It is a combination of a few references. In the end it is one of my favorites of the group. 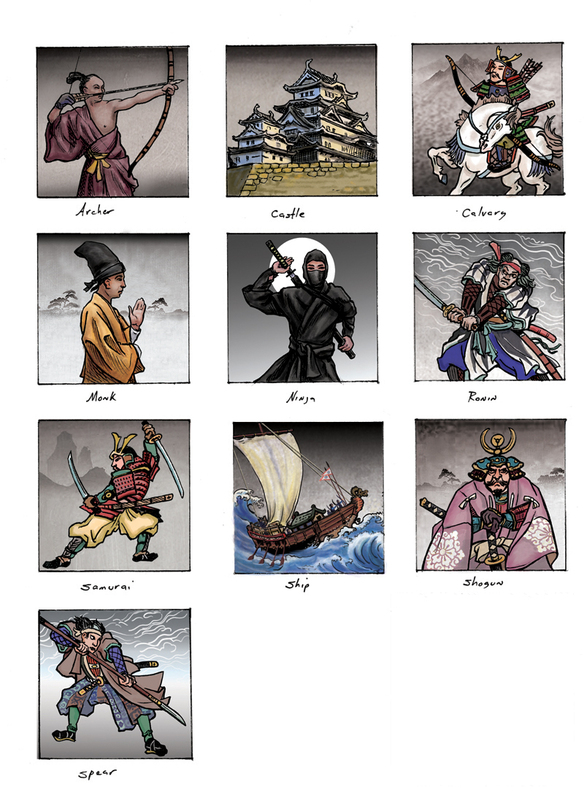 Let me know what you think of the group of Samurai. If you do not comment, I will be forced to commit ritual Seppuku. Art Musings Games you will never get rid of.